Lenticular films produce special flip (animation/stereo), motion, morphing (transformation) and 3D effects. The lenticular images are used for high-end products such as magazine covers, packaging, cases for CDs, DVDs etc., mouse pads, postcards and luxury packaging. Printing on lenticular films requires a high level of process know-how. 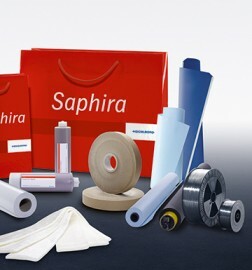 As well as a comprehensive knowledge of the UV printing process, special prepress and material know-how is required. High register accuracy is also needed, as even minute differences can lead to undesirable effects in the lenticular image. The laterally reversed image is printed onto the smooth reverse side of a lenticular film. The process colors are applied first using UV printing and then a full-area UV opaque white is added. Finally, a full-area protective UV gloss coating is applied.